"My belly has reached the point where I cannot see my feet. Help!" "I need to lose weight in my tummy area immediately. What do you suggest?" "Ok, I looked in the mirror and I hate my belly. I need to fix this NOW." "I've tried everything to reduce my belly fat. What else can I try?" You can have the lean, flat stomach you've always wanted! Simply make these nutrition, exercise, and posture tips part of your daily life and you'll blast away your belly fat. Keep reading and start today! Eating for a Flat Stomach. What's a healthy body weight for you? Maintain a healthy body weight. If you're already above your ideal weight, you'll need to burn more calories than you consume to lose those excess pounds. It's great to tone your stomach muscles, but they'll remain hidden until you shed any fat that covers them. How much fiber do you consume? Get plenty of fiber. A diet high in fiber will help prevent bloating. Whole wheat and other grains also help you feel fuller faster, and most vegetables are low in calories. How much sodium do you consume? Cut down on sodium. Many people eat twice as much sodium as health experts recommend. Too much salt can lead to high blood pressure as well as bloating. The biggest culprit is processed food, so read those nutrition labels and prepare your own dishes from fresh ingredients. Drinking plenty of water also helps to lower your sodium levels. Eat smaller meals. If lavish dinners make your belly bulge, try switching to smaller and more frequent meals. Eat 5 to 6 times a day every 3-4 hours. You'll be less likely to get hungry and overindulge. What is your doctor's opinion? See your doctor. 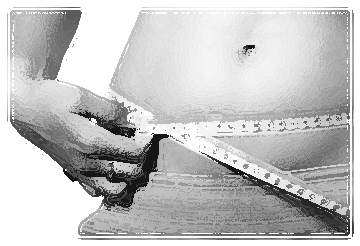 If you're losing weight but failing to see any change in your waistline, talk with your doctor. There are tests that can detect if you have food allergies. You may need to avoid certain foods or take enzyme drops or tablets for lactose intolerance. Exercising for a Tighter Tummy. Have you heard of the spot reduction myth? Understand the myth of spot reduction. Your body gains weight all over and loses it the same way. Forget about the miracle gadgets advertised on television that promise instant results. Save your money and devote your energy to more sensible eating and regular exercise. When will pencil in some aerobics? Do aerobics daily. Aerobic exercise is the best way to burn more calories. Take a daily walk or run. Go swimming or skating. Aim for about 30 minutes of activity a day. Supplement that with lifestyle changes like using the stairs instead of the elevator. When will you pencil in some muscle building? Strengthen your upper body muscles. Building strong muscles in your shoulders, chest, and back will improve your posture and keep your abdomen from sticking out. Do some weight training or Pilates a few times each week. What tummy exercises will you do? Tone your stomach muscles. Spot exercises are effective in combination with aerobics and strength training. Crunches and leg lifts tighten and tone your stomach muscles. How can you make this fun? Have fun. Make your exercise routine enjoyable so you'll want to stick with it. Design a variety of activities. Reward yourself when you make progress towards a slimmer waistline. Can you press your navel? Tuck your tummy in. Imagine that you're pressing your navel back against your spine. Even if it feels a little awkward at first, it will quickly become a habit with regular practice. The results are fast. Your abdomen will look flatter. You'll breathe more deeply and feel more energetic. Even your clothes will look better on you. Pull your shoulders back. Letting your shoulders drop back and relax helps to raise your chest up. This way, all of your core muscles support your weight instead of making just your abdomen carry the load. Keep your body in alignment. Whether sitting or standing, try to position your ears, shoulders and hips in one vertical line. Balance your weight evenly over the balls and heels of your feet while walking or standing. Switch positions occasionally when sitting or standing for a long time. A flat stomach can work wonders on your health and appearance. Eat right, exercise, and stand up straight. You'll love your new look. Eat healthier, lose weight and solve your problem, click here.